Alfred James Cavill was born at Bishops Hull, Taunton, in 1883. He was the youngest child of gardener William John Cavill (1845-1930) and Elizabeth née Storey (b1844). In the 1891 census William and Elizabeth were listed living in the village of Bishops Hull with their four children; Henry (b1878), Florence (b1879), Frank (b1881) and eight-year old Alfred. At Taunton, in the autumn of 1910, Alfred married Bessie Sprouting (1888-1949) of Bawdrip, near Bridgwater. Alfred and Bessie set up home at 2 Park Road, Yeovil, and were recorded there in the 1911 census where Alfred gave his occupation as a gardener, like his father. Alfred and Bessie were to have two children. The couple later moved to 2 Higher Cottages, Larkhill Road which, at the time, was in the parish of Preston Plucknett. Alfred was a member of the Yeovil National Reservists and at the outbreak of war, as a Reservist, was immediately called up on 25 August 1914 and sent to France with the 6th Battalion, Somerset Light Infantry. Much of June 1915 was spent in the trenches to the east of Ypres where, although there were no pitched battles as such, the Battalion was under constant shell fire and rifle fire. For much of July the Battalion was employed in carrying supplies to the frontline trenches. The rest of the year passed in day-to-day trench warfare with, as the Regimental History points out "Two days in and two days out of the front line was the rule at this period, but between the miserable conditions of the billets and the filthy state of the trenches there was little choice." Nevertheless the dangers of almost constant shelling from the enemy was an ever-present danger and during the night of 17 September 1915 Alfred was in a 60-man strong working party maintaining trenches near Ypres. The trench came under mortar fire and Alfred was mortally wounded, soon succumbing to his wounds while being stretchered to a dressing station. He was aged 34. 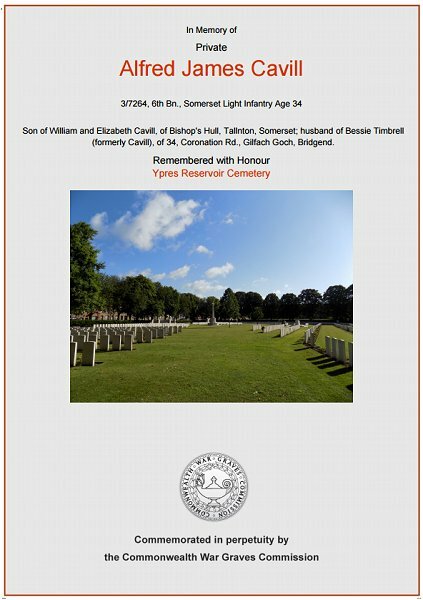 On 24 September 1915, the Western Gazette reported "Another local man to fall in the defence of his county is Private Cavill, who was serving with the 6th Somersets, the Regiment which embodied the Yeovil National Reservists of which he was a member, being called up on August 25th last year. The first intimation received by his widow, who is left with two young children, and resides at 2 Higher-cottages, Larkhill, was on Monday from Private Medlin, who on returning home on leave was deputised to take back the deceased soldier's belongings. Mrs Cavill has since received a letter from the officer commanding the Company to which the deceased was attached which reads as follows :- "I have a most sad and difficult letter to write to you, and one which will give you great pain, I know. A party of some sixty of the Company were out upon a work last night digging and improving trenches, and your husband was with them. They were some distance in the rear of the front line trenches, and soon after the party arrived, the Germans started to use trench mortars and other diabolical means of warfare. It was but a very short time before one fell in the trench, and your husband happened to be very close to the spot. He was very severely wounded, but the shock and severity of his injuries were more than any man could have stood, and soon after the stretcher bearers started to carry him back to the dressing station he succumbed to his wounds. From information I have been able to gather, your husband never really regained consciousness, and can therefore not have suffered much pain, for which I am thankful." Referring to the returning of the deceased's belongings, the officer continues :- "Private Medlin is the bearer of these sad relics of a brave man. No nobler death than that of a soldier who dies for his country in this war can there be. You have my heartfelt sympathy in this your terrible loss." Another letter has been received from lance-Corporal W Axe, who says that he has lost a "brave mate." Previous to being called up, Private Cavill, was employed at Messrs Petters' at Yeovil." 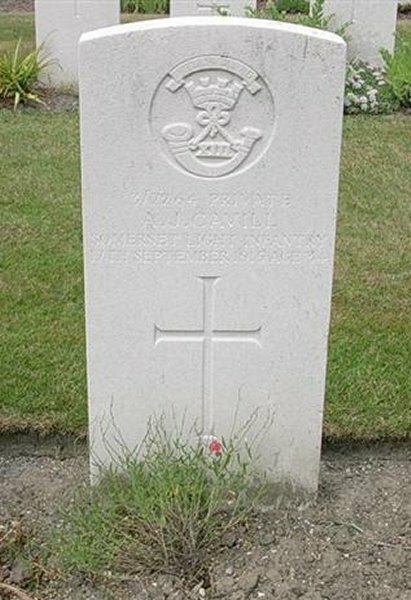 Alfred Cavill was interred at Ypres Reservoir Cemetery, West-Vlaanderen, Belgium, Grave XI.C.27, and his name is recorded on the Preston Plucknett War Memorial (as James Cavell). Alfred's widow, Bessie, married Edward Timbrell in the winter of 1919 at Pontypridd, Wales, and later lived at Bridgend, Wales. The Commonwealth War Graves Commission certificate in memory of Alfred Cavill.